I'm going trying to write this blog Dan style with a good narrative for the recipe. September 14th was a hard day. It was Yom Kippur, day of fasting to feel hunger as a reminder to help others in need and to reflect upon the year that marked the end of the Jewish New Year. It also marked the one year anniversary of my brother, Daniel's passing, so we had a lot more to reflect on. I've been waiting for this day, I knew it was going to be hard, and it came by too quickly. I wanted to do something special to commemorate Daniel, so I knew I was going to make haggis. It's something I've been thinking about for a long time already and I knew my brother would have loved it. I decided to make the haggis on the 15th so I could focus on Yom Kippur and my reflection on the year. All the memories of my brother, all the things I would have shared with him, and all the times that I miss him. I woke up on September 15th ready to go. I started the morning off by making my daughter and my wife a failed breakfast burrito that my wife saved by turning into a breakfast quesadilla. What a sweetheart she is! I over stuffed the burrito so it wouldn't fold. So probably from all those times we watched the Food Network show "Chopped" together, shequickly thought "just slap another tortilla on top and call it a quesadilla". I knew by 10am I wanted to get the haggis started. I've written at my blog Gluten Free Edmonton in the past about a cookbook called "Make It Fast, Cook it Slow" by Stephanie O'Dea. A gluten free slow cooker book that my wife Amanda and I love. It happens to have a non-tradition haggis recipe that called for beef and lamb instead of the traditional heart, liver and lungs. It was going to take 6-7 hours to cook. Unfortunately I was behind schedule with my failed breakfast. But that's okay, it meant I got to play with my daughter while Amanda saved breakfast. By 10:30, I got started, and thankfully it was a pretty easy recipe. Stephanie O'Dea describes haggis as a meatloaf. She also describes it at the start as a blob. Which it truly was. 1/2 cup gluten free chicken broth (once again, if you don't have Celiac Disease, you probably don't need to check the label for any additives). This recipe called for a 4 quart slow cooker. We love slow cooking, so we actually have a large one and a smaller one. You make the loaf by mixing in all the ingredients except for the cooking spray and broth. Mix everything up really well. Spray the inside of the slow cooker stoneware with the cooking spray. Be sure to spray all of the inside to ensure the loaf doesn't stick (this was something I never thought of doing). Mold your meat mixture and place into the slow cooker. Add 1/2 cup of broth (I actually added a cup, because I think I had more meat than the recipe called for). Cook on low for 6-7 hours until the ends are browned and the top begins to brown. And I agree with Stephanie when she said "Don't overcook", you don't want a dense, hard and dry loaf. Take out of the slow cooker carefully and let it rest for 30 minutes before cutting. Before starting the recipe Amanda texted Meredith asking "What do you actually eat haggis with". Her response "tatties", which she then went on to explain is "a very UK description of potatoes". So Amanda made up some yummy season roasted potatoes with Italian seasonings and steamed carrots with honey and thyme. I of course added some herring in a dish on the side to complete the haggis and herring loop. The candle is lit to commemorate Daniel - A Jewish tradition to remember those that have passed on. The aroma the mixture gave off while making the haggis was wonderful. I was really looking forward to trying this. After putting everything into the slow cooker my daughter (14 months), Amanda and I all took off to run errands for the day. When we came back to the house everything smelled so great. I was really anxious to eat this meal. When the time was up, Amanda carefully took out the loaf for me while I played more with my daughter (she loves Lego and Cars, go figure if you knew my brother and I). My in laws came over to join us for this commemorative dinner. I did enjoy the haggis. I've written about meat loafs before on my blog, and they always seem to end up pretty dense and dry. I think the oats really helped make the loaf more fluffy and edible. The sides Amanda put together went great with haggis. The seasoned potatoes and the sweetness of the carrots really made this a nice meal. 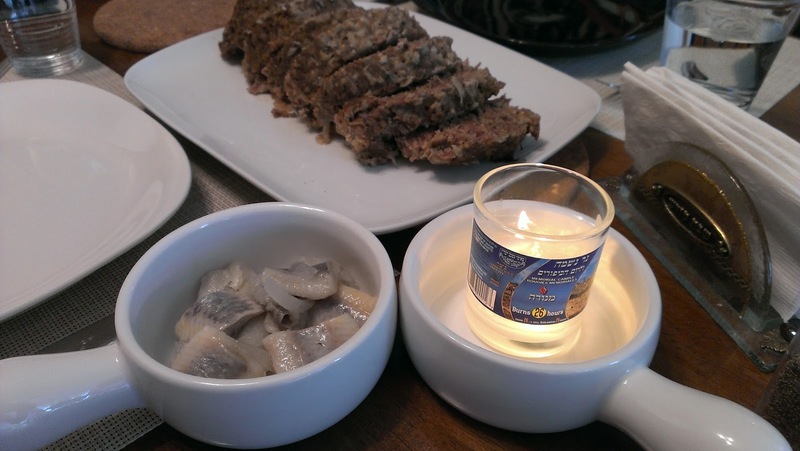 And the herring on the table, although not cohesive, was just quite fitting. Everything allowed me to feel good about what we put together to remember my brother. I can comfortably say, I look forward to making this every year. Excellent job - Daniel would be super proud. This sounds so good. I love the fact that it is cooked in a slow cooker. Makes meal getting easy if you have a busy day, no matter who you are. Thanks for sharing. i was not a fan of food made from organs but this is great! thanks for a great recipe!